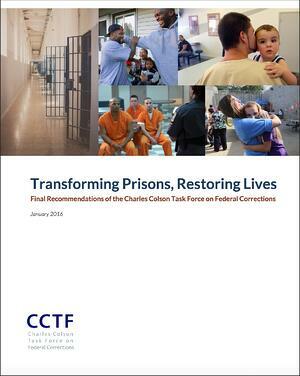 After a 12-month investigation, the Charles Colson Task Force on Federal Corrections established by Congress has issued a report with six recommendations for the federal corrections system designed to improve public safety, increase accountability of those in the criminal justice system, and reduce recidivism. In prison, the federal Bureau of Prisons should promote a culture of safety and rehabilitation and ensure that programming is allocated in accordance with individual risk and needs. Federal prisons should be characterized by conditions of confinement that are safe, humane, and conducive to self-betterment. Staffing levels should be sufficient to ensure a safe environment, and housing, treatment, and program offerings should be tailored to the specific needs of the many diverse populations in federal custody. Contact with relatives and other loved ones should be facilitated during incarceration as an important component of a rehabilitative environment. In support of such rehabilitation, a validated risk and needs assessment should be administered periodically to guide development of individualized case plans and delivery of the targeted services and programs necessary to support reintegration. Throughout the prison term, correctional policies should incentivize participation in risk-reduction programming. Public safety and rehabilitation are best achieved through meaningful incentives for participation in needed evidence-based programming. The most powerful incentive—earned time off one’s sentence—should be used to encourage participation in addiction treatment, cognitive behavioral therapy, educational classes, faith-based programs, and other self-betterment activities prescribed in accordance with individualized case plans. And those who have served substantial time behind bars should be subject to a review of their sentences and circumstances with the opportunity for sentence reduction. Helps promote a culture of safety and rehabilitation that addresses the needs of inmate fathers to become better men, fathers, and partners (e.g. husbands). Data show it not only creates better fathers and contributes to reducing recidivism; it contributes to safety in facilities by reducing behavioral infractions (disciplinary actions) committed by inmates who participate in the program. Promotes and increases contact between incarcerated fathers and children. Has a reentry focus and component that staff can use to help individualize inmates’ reentry (reintegration) plans. Is an educational, cognitive-behavioral program. The InsideOut Dad® Guide to Family Ties, a self-paced guide that helps incarcerated fathers learn the importance of getting in touch—and staying in touch—with their family. It also helps incarcerated fathers create strong ties between themselves and their children, and between them and the mother of their children. Out of the Ashes (DVD and Discussion Guide), NFI’s newest resource for serving incarcerated fathers. This powerful film with accompanying discussion guide helps generate healing among fathers, children, and family members impacted by a father’s incarceration. Brochures and other print materials that address the unique needs of incarcerated fathers (e.g. how to stay connected to children while incarcerated and how to create a successful reentry plan) and all fathers (e.g. how to effectively discipline children). I encourage you to read the task force’s report to learn about all six recommendations and reflect on how implementing any or all of them can improve corrections systems. Click here to download a copy. Are you using all of NFI’s resources for incarcerated fathers? How can you encourage the implementation of the task force’s recommendations?